Going green is not just good for the environment, it’s also good for mobile operators. It is common knowledge that the share of energy drives the largest costs in mobile network deployments – about 50% of the total OPEX in emerging markets. While diesel power systems play a large part in the high level of expenditure, according to a 2014 GSMA Green Power for Mobile report, they account today for nearly ​90% of power solutions used in off-grid and unreliable grid sites. Operational fuel costs, logistics (transportation, depositing), diesel pilferage – which alone increases costs with about 15%-20%, the need for continual service in areas where power outages are frequent, all add up to operators’ investment and operational expenditure, reflecting eventually in a higher service cost for users and therefore in a drop in use of mobile services. ​60% of the overall network infrastructure costs is attributable to building and powering cell towers , so saving on energy requires the choice of equipment that uses makes a more efficient use of power resources. Deploying cell sites using green energy is easy when using a base station like SatSite, which requires a low power input (45W) and is ideal for installing in remote areas with unstable or no electrical grids. Cell towers using SatSite in either single or 3-sector configuration are a lightweight deployment which allows it to serve isolated or remote locations, relying only on the existing natural resources. SatSite’s design differentiates from that of traditional base station by integrating a passive cooling system that makes its use independent from air conditioning or ventilation units. The power required for air conditioning makes up for a large part of the overall input needed to run operate a site. Eliminating air conditioning also frees up space to make cell towers more resilient. Over diesel power systems, solar panels and wind turbines, for example, have a much longer life expectancy, that can range to 20-25 years. Combined with diesel power in hybrid energy systems, operators can achieve a longer and more reliable operation of cell towers, driving down fuel costs to save ​more than $10 billion annually. Shifting to green towers has major implications. First, it reduces operators’ costs and allows them to extend mobile networks in places in areas that are completely deprived of coverage due to the lack of an adequate infrastructure. Then, it reduces the negative effects on environment; GSMA ​reports that an off-grid site in Africa has an average annual consumption of 13,000 litres of diesel, adding as much as 35 tons of CO2 emissions to the environment. 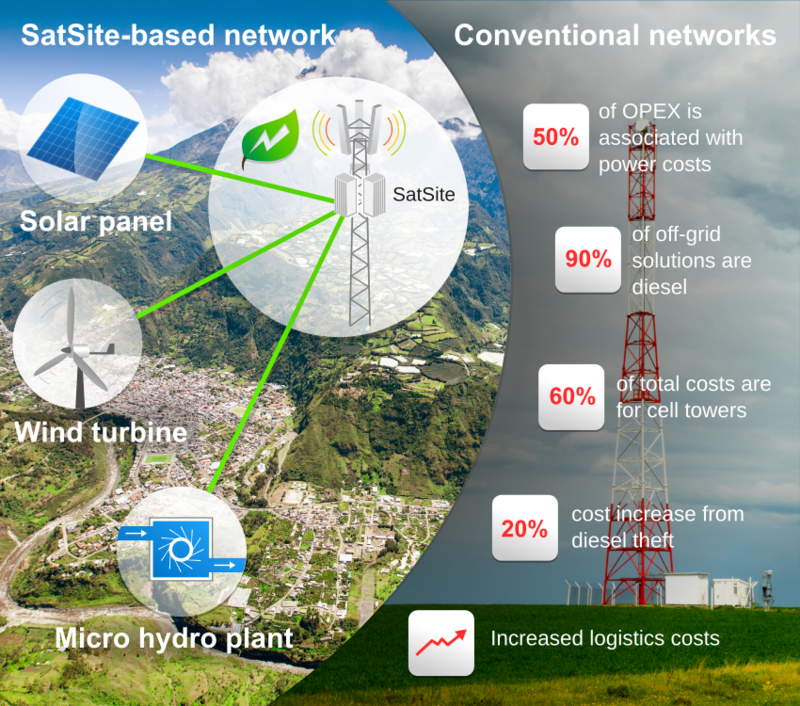 If they choose green energy for telecom towers in remote areas, operators must move to smaller, more autonomous cell sites; profitability will come not only from power savings and a rise in service use, but also from reshaping the overall network infrastructure to better manage power factors. Telecom infrastructure sharing, http://en.wikipedia.org/w/index.php?title=Telecom_infrastructure_sharing&oldid=624429583 (last visited June 10, 2015). This entry was posted in Low-power, SatSite. Bookmark the permalink.